At the end of this review, you’ll have a chance to win one of two free copies of the “Cooking with Cats” coloring book. Please follow the instructions at the end. We will notify the lucky recipients via email in order to get their mailing information. Look for an email from thecontemporarypet@yahoo.com. 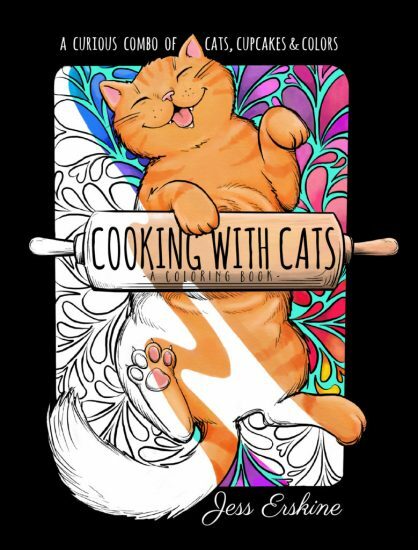 Jess Erskine, a self-taught illustrator, is making waves in the adult coloring book field with her latest release, “Cooking with Cats.” The charming coloring book is filled with delightful images of cats of all shapes and sizes pretending to be anything from donuts to sushi. Erskine recognizes the value of creating an adult coloring book that is filled with lively images that will capture and hold the attention and talents of the adult coloring book market while remaining whimsical and entertaining. It’s a potent combination that she’s mastered with her detailed illustrations. The sushi roll cat looks extremely irritated to be transformed into seafood instead of eating it. We were sent a copy of Cooking with Cats to check out and we fell in love with some of the amusing images. 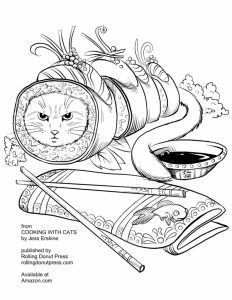 They are intricate enough to hold the interest of any level of coloring aficionado, but they’re cute enough that your kids will want to steal “Cooking with Cats” for their own coloring projects. When asked about the images in the coloring book, Jess Erskine said that they are essentially a “mash-up” of cats with all her favorite foods. If you love cinnamon buns and tabbies, this is the coloring book you’ve been waiting for. There are twenty-five detailed drawings illustrating cats exhibiting various moods from angry to delighted while being (somewhat) disguised as tasty treats. To order your own copy of “Cooking with Cats,” go to Rolling Donut Press or Amazon. Thanks for reading this far! Please feel free to comment below. If you’re the first person to comment on this review, Rolling Donut Press will send you a complimentary copy of “Cooking with Cats.” A second winner will be selected at random. Both winners will be contacted by email. This coloring book looks awesome! Debbie Simpson, congratulations! You were the first person to comment on the “Cooking with Cats” coloring book, so you’ll be receiving your own copy. Please IM or email us at thecontemporarypet@yahoo.com with your mailing address and the publisher, Rolling Donut Press, will send you your own copy. We hope you enjoy it as much as we did! I am an avid colorer. That coloring book would be awesome to add to the books that I have. Hi Linda! You’re the second winner of the “Cooking with Cats” coloring book by Jess Erskine. You can email us at thecontemporarypet.com or IM us on Facebook with your mailing address and Rolling Donut Press will send a copy directly to you. Have fun coloring!